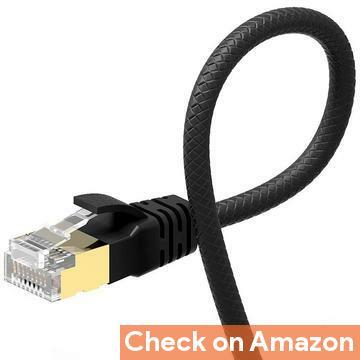 Picking up the best ethernet cable according to your need is certainly not easy. There's many question like speed, latency, interference with other cables and compatibility with the existing network. Price is also major factor, specially when the Ethernet cable is long. As an example, you don't need a shielded CAT7 cable to simply share the internet, which barely reaches over 100 Mbps. But if yo're thinking about high speed data transfer between NAS and a PC, then a high quality cable is much better option. So, before buying be informed and make sure to check out the buying guide. The word "best" doesn't fit here actually. Choosing the right ethernet cable depends on the usage purpose. As example, if speed and minimal latency is not you priority, then you could easily setup your network with CAT 5e cables. Also keep in mind that if you're running multiple CAT 5e cables together, and along with the AC power lines, there will be performance issue. CAT 6 cables are good enough for speed up to 10 Gbps, and inherantly better crosstalk immunity compared to CAT 5e. So you could consider them quite future proof, at least for 5 years. So CAT 6 cables are quite a good choice for new network cable installations or upgrading the existing network. 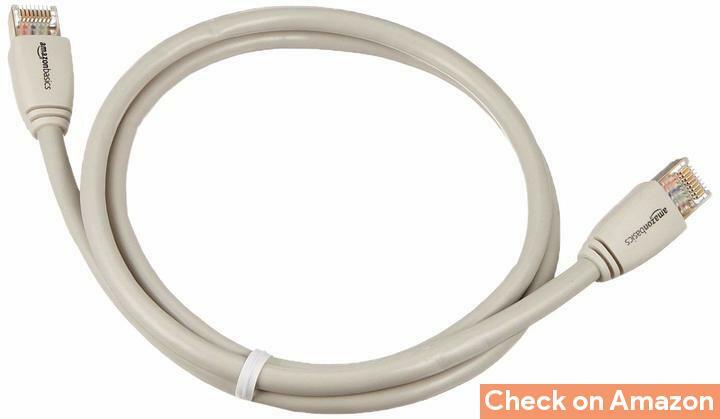 Another important point to note, ethernet cable's outer jacket is generally made out of PVC and of various ratings, like CM, CMR. If you're planning to run the bare cables outside without any protection, better choose a cable with thicker jacket. So, you should consider the above points above purchasing the cable. 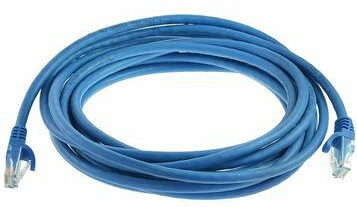 One of the best quality yet affordable cable, if your requirement is 25 feet or less. 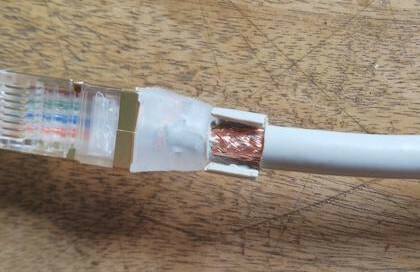 This CAT 7 cable has 3 layer of shielding. Each of the 4 individual pair are shielded with mylar aluminium foil. Then all the four pair are shielded together with another layer of aluminium. After that, there's a braided copper shielding. The copper shield is also soldered to the metal cover of the RJ45 connectors. 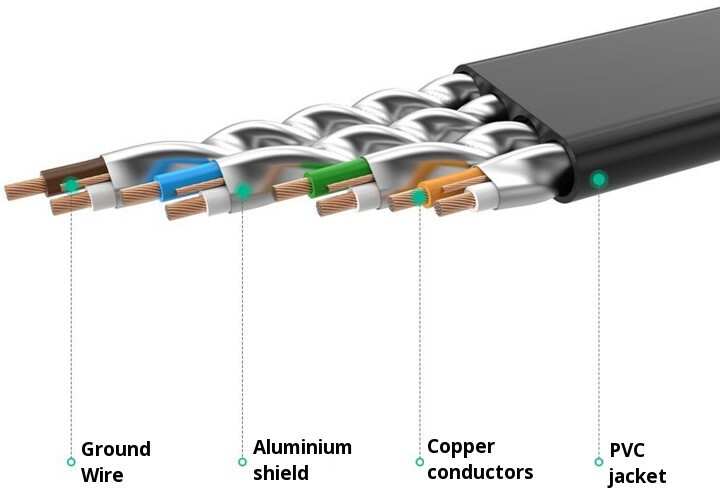 Such a triple layered shielding and metal covered connectors eliminates almost any chance of cross talk and EMI interference. Also minimizes the latency. This cable is a bit thicker compared to regular CAT6 cable. Also much more rigid, comparable to a HDMI cable. A little downside is you might need to remove the soft plastic cover to fit into your Ethernet port, it's a bit chunky. So, I'd definitely recommend this for short connections, where flexibility is not an issue. Flat cables are easy to lay under the carpet and generally are more flexible. Despite it's weird name, this cable got all the bells and whistles to qualify as one of the best cheap ethernet cable. As the cable is flat, there's no extra shielding and the copper conductors are stranded, this cable is quite flexible unlike the previous one. Even though there's no extra foam separator between the twisted pairs, this cable is surprisingly immune to cross talk. You could easily lay multiple keep together without any significant performance degradation. The only doubt I've about this cable it's claim to deliver 10 Gbps speed. It may be possible if the cable is under 10 feet, not more than that. And of course this cable is not for permanent outdoor use. Finally I'd this cable from Jadol is one of the best ethernet cable with a reasonable price tag. If you've plan to install a networking cable on a damp or outdoor environment it's should be your choice. The conductor wires are made out of 26 AWG solid core copper. This cable is quite thick and robust, even though there's no layered shielding. The outer diameter is around 7.3 mm, compared to 6 mm of the cable from Amazon Basics cable. As the outer protective jacket is quite thick, so you could expect a better water resistance and sunlight(UV) protection. Certainly it's the best ethernet cable of 2019 for outdoor applications. If ultimate speed and noise immunity is not your priority, than this cable from Mediabridge could be your choice. Unlike other CAT 7 cables, it's significantly cheaper. Even though there's no shielding, you could expect this cable is suitable for a Gigabit home network. But it may add extra 1 or 2 milliseconds of latency, specially if it's concealed inside the wall along with AC power lines. However that few milliseconds of extra lag on your network should not create any problem in most cases. 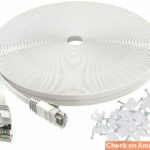 This could be the best cheap ethernet cable for laying around long connections around the house. 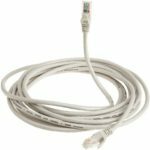 CAT 5e cables are the cheapest one in this category. So once again this product from Amazon in the list for it's reasonable pricing. If you just want to share the internet, which barely reaches around 100Mbps, a CAT 5e cable is good enough for that purpose. Cat 5e cables are the cheapest by far you can buy. Though has the sufficient potential to reach near gigabit speed. One more thing I want to add from my personal experience. This cable isn't particularly made for outdoor use. The outer PVC jacket becomes quite withered by sunlight and heat. It's good enough for indoor use. Packet loss and ping spikes are not good for gaming. This happens a lot when the network cable is long enough and multiple cables are cluttered together. Cross talk between cables cause packet loss and increases network latency. But packet loss could be minimized and latency could be improved with shielded ethernet cables. Many gamer often carry their laptop to play with friends or online, thus they also need to carry the cables. Also they need to connect and disconnect the cables multiple times. As flat cables are much flexible compared to round cables, and lesser chance of tangling up, flat cables are generally better for gaming. Let's have a look through the list of best ethnet cable for gaming. This cable from Ugreen has it all, value, quality and flexibility. Here each of the four pair are shielded individually with mylar aluminium foil. The RJ 45 connectors are also has a metal shielding, and that's all the shielding you got. I also want to mention that each of the main conductor is made from stranded copper wires. And there's also an stranded copper ground wire to make it even more immune to EMI interference and cross talk. As the cable is flat, there's only one layer of shielding, and made out of stranded copper wire, this cable is quite flexible. So, if flat and flexible cable is your priority without compromising speed and packet loss, it's one of the best ethernet cable for gaming . Braided cables are even more flexible than the PVC covered flat ethernet cables. SO, this product from Tega Grand could be your choice if flexibility is your priority without compromising quality. As the copper conductor wire's are stranded, and the outer jacket is mad of braided nylon, so this cable is quite flexible. It could be the top ethernet cable for carrying around inside a bag without tingling up the cable much. Another flat cable, with quite good build quality and a literally a lot of variety to choose. It's one of the longest available ready made flat ethernet cables. As of this particular model, the cable is made out of solid core copper wires, ideal for long layout over 20 feet. Though the RJ 45 connectors have a metal shielding, but they're not connected on the both ends. So it's not as effective compared to others to suppress the EMI interference. It should be able to handle speed around 10 Gbps without much problem. 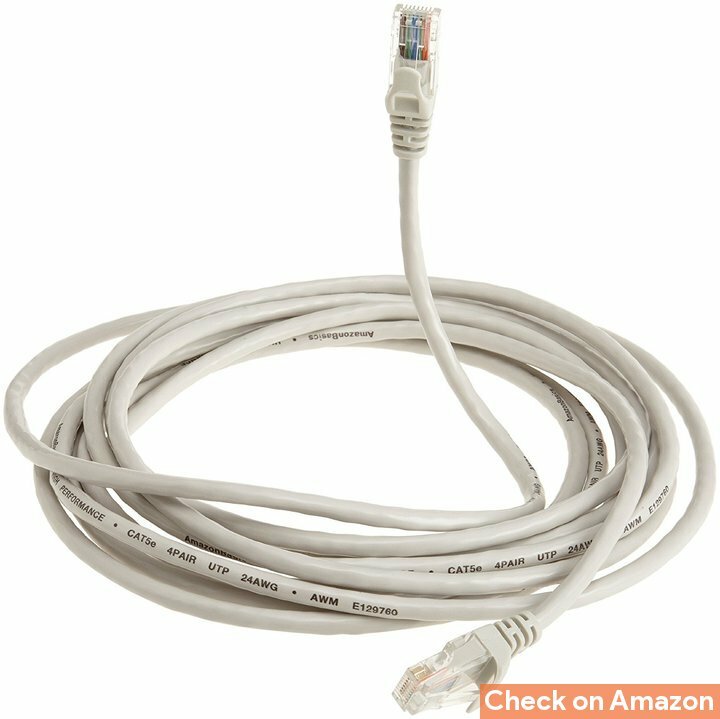 CAT8 cables have even tighter specifications than CAT 7 cables. They're not only double shielded, another separate ground wire runs along the twisted pairs, known as rip cord. Such an arrangement provides excellent noise and cross talk immunity. Speed of up to 40 Gbps could be achieved through this cable, as claimed by the manufacturer. 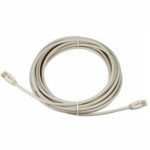 However this cable is also compaitable with CAT 5e, CAT 6 or CAT 7 cables and older hardware, as the wiring is same. For most users CAT 8 cables are overkill. But if you're super crazy about speed latency and packet loss, than it's the best best ethernet cable for you. Another product from Jadol, with is's multicolored flat CAT 7 cables. Sometimes a single cable is not enough, specially when extending your existing network with a Ethernet switch or router. So you might want to buy a bunch of them. Many people colorful cords and cables, others are not great fan of. 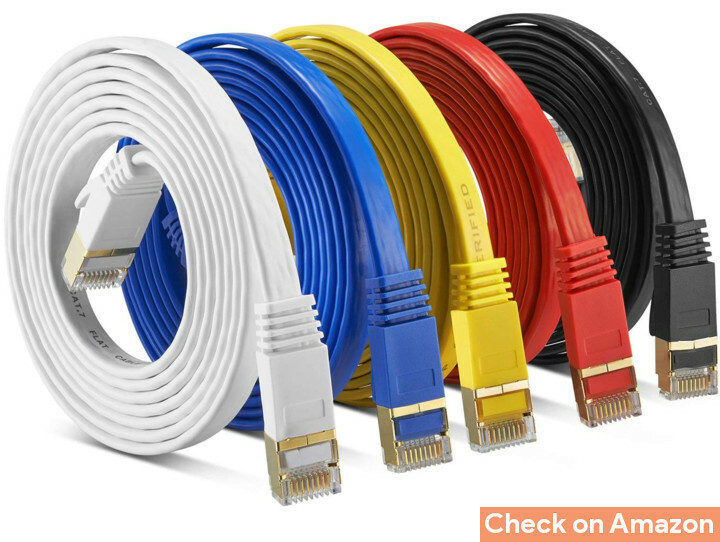 But surely this 5 differently colored cables are the best ethernet cable for show off. You may already know there's few different type of ethernet cable, each with a different purpose. 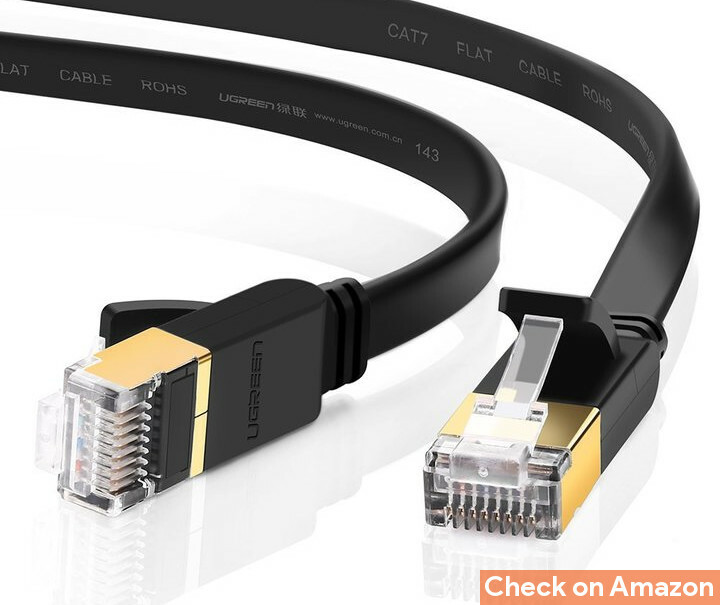 Here we'll discus about some essential knowledge about ethernet cables for absolute beginners, to help them to find out the best ethernet cable. What are the different type of ethernet cables available in the market? Ethernet works over either copper wires or optical fibers. And we're not discussing about optical Fiber cables here. So, currently 4 type of copper ethernet cable are used mostly, CAT 5, CAT 6, CAT 7 and CAT 8. We generally use the enhanced version of CAT 5 cables, CAT 5e. CAT6 cables also got another enhanced version with better specifications, CAT 6a. Many cable manufacturer also mark their cable cat CAT 6e or CAT 7a, which are nothing more than marketing gimmick. What is the difference between CAT 5 and CAT 6 cables? The main difference between them is speed and frequency range. CAT 6 cables got a better cable cable structure and different of twisting geometry on the twisted pairs. Also there's a foam of LDPE separator between the 4 pairs. Due to it's superior construction quality, CAT 6 cables could go up to 550 to 600 MHz and speed over 10 Gbps. While CAT 5e cables are stuck at 250 MHz and speed of up to 1 Gbps. Both the CAT 5 and CAT 6 cables have about the same maximum length, 100 meters. But If you're planning to build a 10 Gbps network over a segment of 100 meter of CAT 6 cable, the maximum speed won't reach 10 Gbps. Not at all. Auto MDI/MDIX eliminates the need of crossover cables. This feature, Automatic MDI/MDIX is present in almost every modern ethernet adapter, including USB ethernet adapters. Straight cables are good enough, unless you're using a really really old Ethernet adapter hardware. 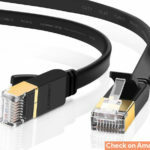 When to use flat Ethernet cables? Any type of flat cable is inherently flexible compared to any round cable of same gauge. So flat ethernet cables are good choice if you've to lay the cables under a mat or carpet. They are also easy to bend around the corners of wall or table due to it's flat construction. There's another type of flat cables, the nylon braided cables. These are even more flexible and easy to carry around. But you should remember that braided cables are not the best ethernet cable choice for prolonged outdoor use. Single stranded or multi-stranded cables? Obviously the answer depends on the usage purpose. Any type of multi stranded cables are much more flexible, but also more expensive. So for short lengths where felxibility is the priority, it's better to use a multi stranded networking cable. On the other hand, single stranded ethernet cables are more durable and cheaper comparatively. For it's durability you should always opt in for single stranded cables for outdoor use, specially when you need to deliver power over the same cable through PoE injectors. Simply it's just another type of Ethernet cable. But this this time the cable is shielded. That's why it's called STP cable, shielded twisted pair. There could be a single layer of shielding over each twisted pair, or multiple layer(up to 3) of shielding. Generally the RJ 45 connectors are also shielded with metal covers for even better performance. 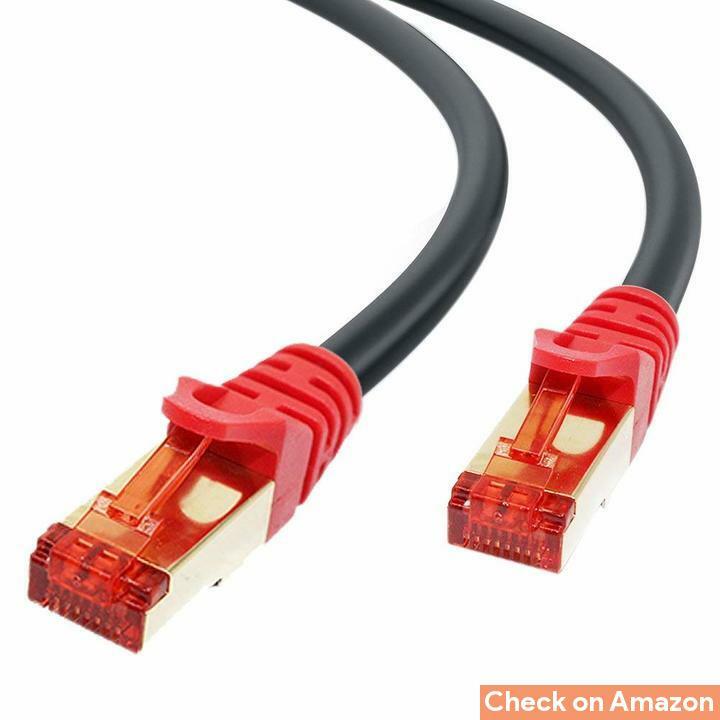 How fast is a Cat 7 cable? Due to the shielding, CAT 7 cables are much more immune to cross talk from nearby cables and there's almost zero chance of electromagnetic interference. Such an shielded cable arrangement could easily cross the boundary of 10 Gbps, and suitable up to 40 Gbps speed under 50 meters of length. The career frequency on short cables could be as high as 650 MHz, and operates at 500 MHz on length up to 100 meters. 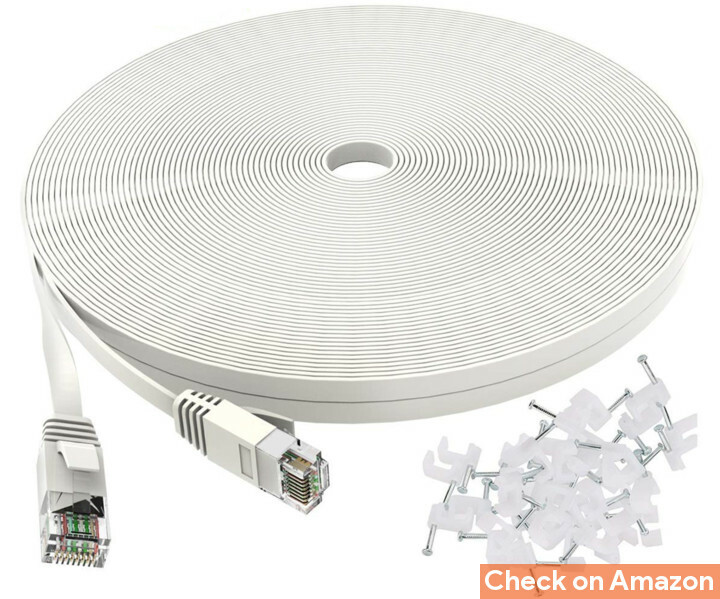 Is Cat 7 better than Cat6A? Yes, Cat7 cables are better than any Cat6A or Cat5e cables. Cat7 cables has significantly lower latency and jitter compared to Cat6A cables. I have some actual test results to show the difference. A 15 feet Cat7 connected to my home server, ping time is very consistence, almost never goes up more than 0.7 ms, negligible jitter, and delivers gigabit speed always. 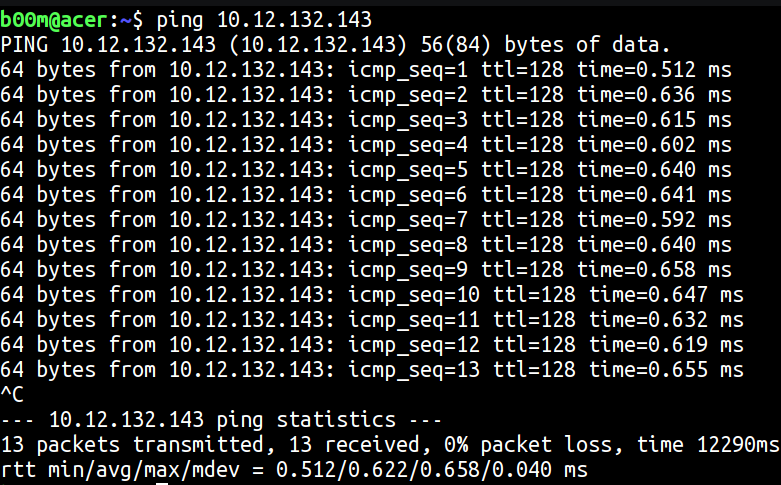 While with Cat6 cables, the ping time is almost double most of the time. But there's also downside of these CAT 7 cables. 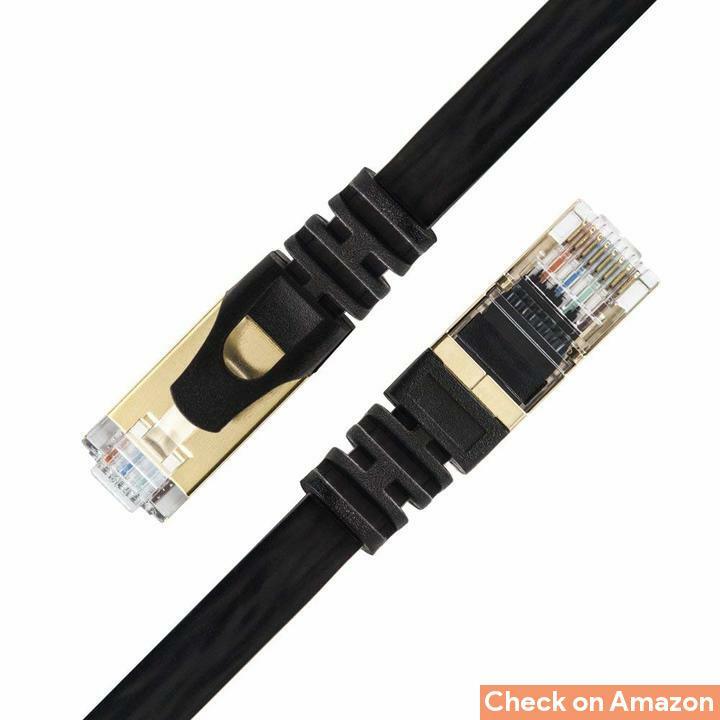 They're about twice expensive compared to same length of CAT 6 or CAT 5e cables. 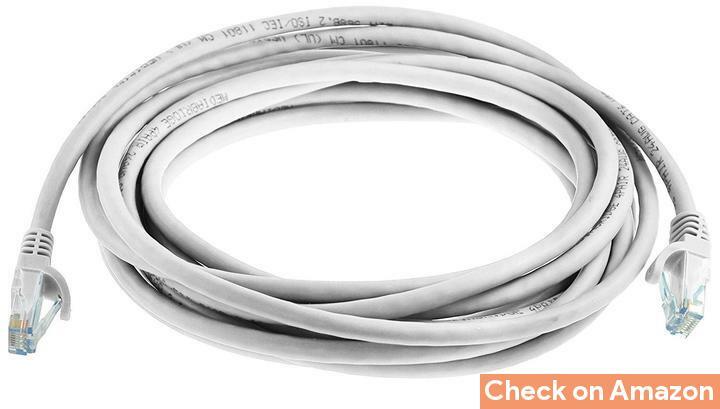 As the cable has one or two extra layer of aluminium foil shielding, these cables are much more stiff compared to a regular CAT 5e cables. Ethernet is still the backbone of home and office networking. Much more reliable and considerably faster than any WiFi adapter. Till now, CAT 6 cables are good enough for SOHO networking, offer data speed of up to 10 Gbps, which is fairly usable in current situation. Choosing the best ethernbet cable according to your need also depends on their availability. All the products listed above are available online. But I never purchased any network cable online before writing this very article. All the network cable I used was made by D-Link, Havells or Finolex. Ironically none of them are easily available online in small quantity. I hope this guide is sensible and informative enough to help you out. If you have any question or suggestion, consider leaving a comment below.